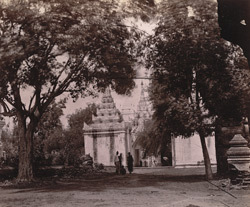 Photograph of the entrance to an unidentified pagoda at Amarapura, Burma (Myanmar), taken by an unknown photographer in the 1880s. Amarapura, which means ‘city of immortality,’ is situated on the west bank of the Irrawaddy River in central Burma. It was founded in 1783 by King Bodawpaya and was the royal capital until 1823 when it reverted to Ava, the former royal capital. Later under King Tharawaddy the court returned to Amarapura and remained until 1856, when King Mindon Min founded Mandalay further north. The city was laid out as a vast walled square surrounded by a moat, and four pagodas marked the corners of the city walls. This view through the trees shows a grand entrance portal to the pagoda, crowned with tiered spires denoting sacred space.